Fredrik Watz ging onderuit waarna rode vlag werd gezwaaid. Hij had ontzettende pijn aan z'n heup. Is voor scan naar ziekenhuis gegaan. Hij is geopereerd. Been was uit de kom. Wednesday night we got back from USA in Stockholm at 02.00 and Thursday around midnight we where leaving to Karlskoga. This weekend was a bit stressful for us as Freddie was taking part in 3 different classes, Superstock 600, 250cc and Sup.sport 600, so both the Yamaha and the Suzuki was used a lot this weekend, and all the classes was after each other so not so much time to take a breath in between. Saturday was qualification day. 2 sessions for every class so Freddie did not do much more than riding bike all day. On the first Superstock qualification Fredrik ended up at 4th place. Back and switch bike for the 250cc qualification,he was the fastest rider on the track with his lap time 1.06.95 before Molina. Back into the paddock for the Supersport session, with 2nd place after Daniel Kubberod. After these 3 sessions it was time for some rest and food and checking on the bikes before the afternoon practice. In the 2e Superstock qualification it did not go any faster as it was so hot weather conditions,the session was also red flagged due to a crash so 4th place on the grid. Changing to 250cc and on that qualification he was a bit faster then the first one, 1.06.76 and pole position for the race before Alvaro Molina second, Giacomo Lucchetti third, Joakim Stensmo fourth. Back into the paddock and for the last time this day he was switching to the 600cc bike and went out for qualification Supersport. On this session he was a bit tired so no improvement lap time. Start from 2nd place in the Supersport race. The evening we spent by fixing the bikes again, and also it was some time to meet up with all our good friends from all over Europe, which was so much fun as we have not seem them all for a long time. A lot of people in the tent all evening and very much fun!! First out was the Superstock and Fredrik did not make so many laps, he was just out to see that the bike was working. Back in again and jump on to the 250cc bike, didn’t made so many laps either but he did good lap times 1.06.88 and that was quite ok. After that another switch to the 600cc bike and back out on the track, made only 5, 6 laps before he thought it was ok and went back into the paddock. Some refuelling and bike checking, and also some lunch and rest before it was time for race. 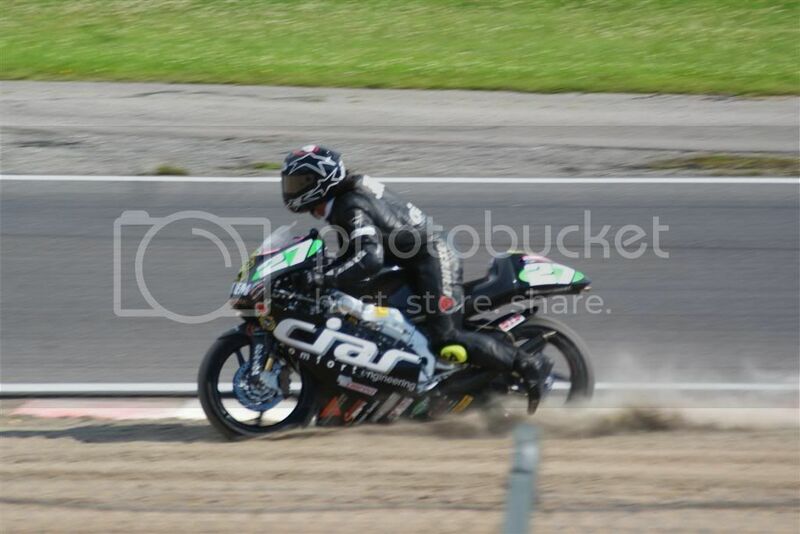 First race was Superstock 600. Freddie did a not so good start but catch up with the riders in front directly. On the first lap the race was stopped due to crashes. New line up at the grid and when the lights went out Freddie did a much better start. Daniel Kubberod made a perfect start and he just went away directly. Freddie was on 2nd place and as him and Kubberod was making almost the same lap times all race Freddie could not catch up with him to fight for the first place, but he ended the race at 2place and we are happy about that, it was a good race and he was satisfied. No price ceremony for Freddie as it was just 5 minutes to start in the 250cc race so no time to rest, just get on the Yamaha and back out on track again. After the sighting lap when Freddie arrived to his spot on the grid he said the bike did not work ok, it was going on one cylinder and behaved really strange. He said he would try for some laps and if that would not go he would stop. After 7 laps he came on the finish straight and after that it is a tight right corner, and there the bike just worked on one cylinder, and in the corner it started working on two again and without any warning the bike throwed him off in a nasty highsider. The race was stopped as Fredrik didn’t moved, and when he came in from the track he was very much in pain, and he said that this was the worst pain he had ever felt in his life, so then it is not so good. He got some pain killers and after half an hour they took him to the hospital in Karlskoga and there they saw what was wrong with his right leg, it had jumped out of place in the hip, and was like 8 cm in the wrong place. But they put him to sleep and put the leg back where it should be. Also he had broken his collar bone, but that is quite standard so nothing to worry about. He was in the hospital over night and this morning they had done the x-ray on him, and that showed that he is in not o good condition at the moment. His hip bone is broken and a lot of bone parts is missing, so now he has to go up to the hospital here in Linkoping and have surgery on that tonight. This was not the most fun ending of the weekend, but before this happened we had a lot of fun, a bit stressful but very nice anyway. It was nice to meet all friends from Europe again and we hope it don’t take long time until we meet again!! op de site van de UEM staat dat er ook een race wordt verreden voor het EK 250 op Assen. Onderstaande link bevat beelden EK 250cc race Karlskoga. Het betreft opwarmronde t/m rode vlag situatie ivm val Fredrik Watz. In de eerste bocht na de start is de crashende coureur Thomas Walther (nr.77). De "men in black" is de italiaan Giacomo Lucchetti. #1 Molina, #69 Stensmo, #27 Lucchetti, #29 Kohlinger, #15 Stoffer, #40 Györfi and #54 Vainikka in the pict plus some more. 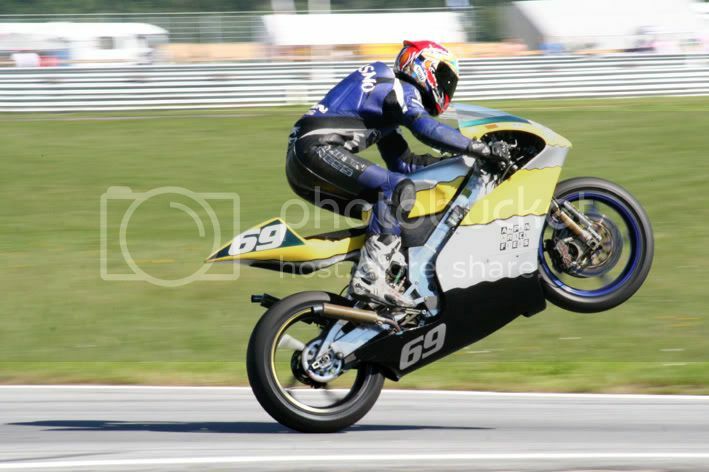 The Italian rider Luccetti did a highsider out to the straight. But did handle it and not crasch! Arms and legs up in the air and he went out in the dirt before going up to the track again. Very spectacular almost crasch! He did take the bike to 6:th position. Unlucky after the race he did get hard to breath! He did hit the windscrean with hes neck. So hes troath did get swollen and he couldnt breath! So from sunday to today hes been send to sleep and breathing with a respirator. By now hes on his way home now. Hope he will be ok!!! Very nice and cool rider! Picture taken by Björn Aronsson in the public. Picture taken by Micke Sundgren. An interview by Micke Sundgren of Luccetti from the UEM weekend. Do you know where I can find more pictures EM Karlskoga? 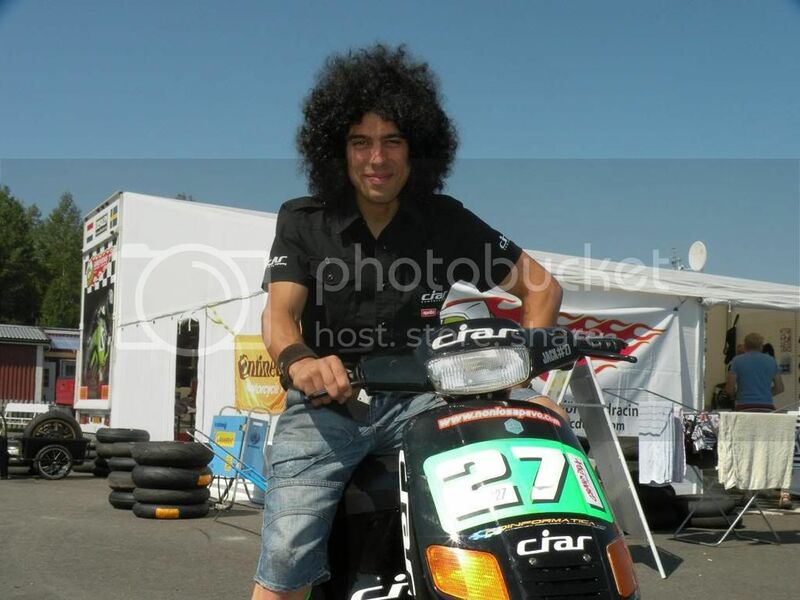 With best regards...and see you at Assen in September? Second half of the 250cc race by Mika Vainikka. In the end after the race in parc fermé you see Luccetti going down on hes knees..
Photo of Joakim Stensmo. Out of the corner "Ejes corner" he did wheelie every laps becouse he did think it was the best way to awoid the bumps there. Someone in the public that did take this. Im also looking for more photos. Sometimes it take some time before the photographers have them out. But www.pargusbild.com is the biggest one that will have photo of every riders. Assen in september we cant miss! Will try to get all 4 250cc bikes in our team over to the race if it possible. Me and Joakim is coming for sure! Will be 4 weekends in a row of racing in september. 33 Justin de Bruin Heerhugowaard BOB BEDANKT ! Zeer fraai goed gevuld startveld met vele snelle rijders die goed aan elkaar gewaagd zullen zijn. Dit wordt genieten voor de 2 takt liefhebbers. Kom snel maar weer eens langs in mijn werkplaats dan leg ik je het uit. Kom wel in Assen kijken in ieder geval. Nee, ben als chauffeur/ helper naar Zandvoort voor Brax racing uitkomend in de Dutch Supercar Challenge met een SEAT leon supercopa.